Am I too old to practice Kung Fu? 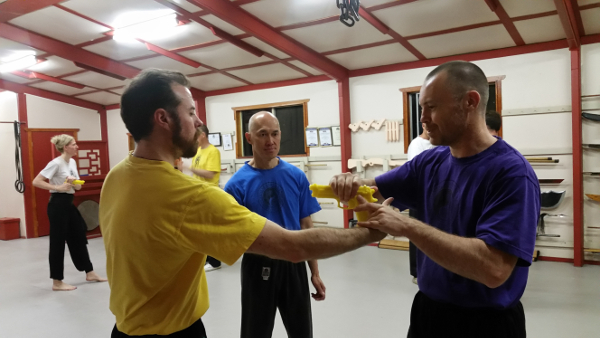 Over the years that we have run our martial arts centre here in Australia, we’ve had inquiries from various people who have expressed concern about whether they were actually too old to do Kung Fu. Well… You got me started. I’m 44 years old this year. Am I also too old to do Kung Fu? I suppose that you might think that I’ve been doing Kung Fu since my pre-conception years? Maybe you think that I popped out and karate-chopped my own umbilical in half just before fly-kicking my doctor in the face for slapping my bottom? There seems to be a common and erroneous public perception which is specific to Australia. I have not seen it as prevalent elsewhere in the world in the places that I have trained in such as South Africa and Taiwan. The perception in Australia is that martial arts is an all-encompassing lifestyle that one is essentially born into. Unless you’ve been doing it from the time that you were knee-high to a grass-hopper, you’ve missed the boat. Too bad, so sad… This is possibly why martial arts schools in Australia seem to target other martial artists with their promotions and advertising. Other martial artists are more likely to join a martial arts school than someone who has never practice martial arts before. It’s a bit weird, if you ask me as someone who comes from a different culture. It’s a bit like a chicken-and-the-egg scenario. “I can’t do martial arts now because I never did it before.” Sound ridiculous? And yet the perception continues to crop up in interviews, inquiries and questionnaires. Well, I’m living proof that this perception is just pure nonsense. Sure, I’ve been practising my chosen system of Kung Fu (Chang Hong) for a long time, just over 20 years, but if you do the maths, you will see easily that I started training Chang Hong ‘late’ too. Sure, I’ve been in physical training since about the age of 13, but my training was more in Western strength training and conditioning with some forays into martial arts along the way. I’ve been interested in martial arts since I was just a young boy, reading about it and practising various techniques since I was about ten, but who didn’t do that back in the 80s? I mean, for crying out loud, this was still the era of Bruce Lee even though he had passed away the previous decade. The Karate Kid. Need I say more? Every single one of us tried to make and throw shuriken (ninja stars) back in the 80s. There was not too much different about me really. And yet, here I am. The SiFu of a school. The head of the Chinese Martial Arts and Health Centre Australia. As the head of the CMAHC Australia, I have taught and watched many kids classes over the years. I’ve seen enough to make a broad, generalised observation. Kids are generally too young to understand the subtleties of our system of martial arts. This is of course a generalisation. There are exceptions, but they are very few and far between. It’s really only around the time that kids reach adolescence and early adulthood that their minds develop to the point where they can start to appreciate the true subtleties of a very subtle art. Note that this does not mean that practising martial arts is not beneficial to children. I’m not saying that the training is useless. By no means am I saying this. What I am saying is that they will really only grasp the deeper principles when they are more mature. True traditional Kung Fu is a mature and challenging system of thought. Not just a physical fighting system. If you practice it, it becomes an all-pervasive influence that challenges you to excel in every single avenue of your life. It seeks to establish awareness, balance, unification, power, honesty and resilience in the practitioner. It is truly a path to expansion of consciousness. Most of our current students are mature people who come from all walks of life. We do have some children who train with us, but they are in the vast minority. Most of our students are in the 20 to 50 year old age group. We are all under a lot of pressure in our modern world. I work part-time as an engineering consultant (if the word ‘part-time’ can ever really be applied to building services engineering where you’re only ever one heartbeat away from a new deadline). When my part-time engineering work is combined with my personal training time, preparation to teach martial arts classes and actual time spent teaching martial arts, it adds up to quite a bit. Between 14 and 17 hours a day spent working. I spend most of my day struggling to get from one place of work to the next. Perpetually slightly late until I collapse into bed to sleep and repeat the following day. I find that I don’t have much time or energy for anything, but I will always apply my special rule. My special rule is that if I want to do something, I will do it now. Regardless of the difficulty. Time has a way of slipping away from us. Do any of you remember the beginning of the Pixar film “Up”? It’s brutal. If you don’t pursue your dreams, if you carry on hoping for a time when everything is going to fall into place for you and you’ll finally have the energy to pursue your dreams in a convenient fashion, you’re fooling yourself. It’s just not going to happen. The stars will never align. You’re going to get to the end of your life and regret is going to slap you through the face like a questionable wet fish wielded by an angry fisherman. If you want something, you have to make it happen right now or you will lose the opportunity to do so. If you’ve always wanted to practice martial arts but have been turned away because of your age or because you haven’t done it before or because you think you’re uncoordinated or unfit, don’t allow these silly perceptions to hold you back. Answer the call of Wushu and start training. Whether you’re 20 or 120, the system is broad enough to adapt to your particular physical situation and constraints. You will absolutely benefit from regular Kung Fu training regardless of your age. Don’t wait for the suspicious wet fish of regret to slap you through the face. Learn Kung Fu and skill yourself in blocking regret and punching life in the face. http://cmahc.com.au/wp-content/uploads/2019/01/old.jpg 338 600 admin_sherrilyn http://cmahc.com.au//uploads/2019/01/brown-logo-212x300.png admin_sherrilyn2018-03-16 08:22:072019-01-29 08:24:13Am I too old to practice Kung Fu?